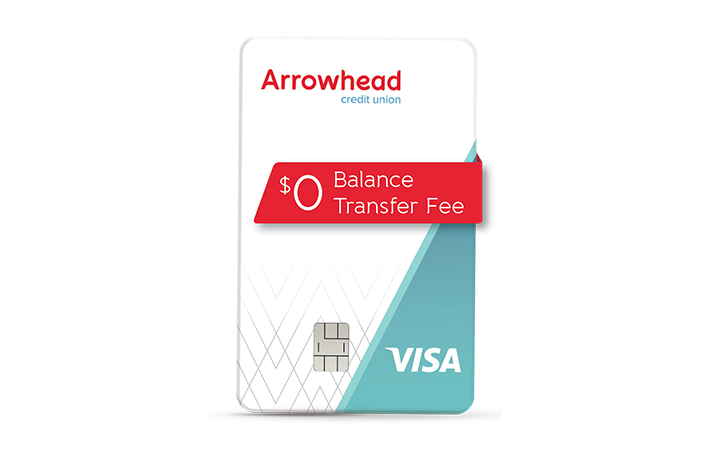 Move your balances to the Arrowhead Visa, with no balance transfer fee. You’ll love having one simple rate whether you use it for purchases, balance transfers or cash advances. Are there any fees on my Arrowhead Visa? There are no monthly or annual fees on your Arrowhead Visa. However, if your payments are not made on time, you may be subject to a late fee. Please refer to the Visa Agreement and Disclosure and Rate Schedule for additional details. Interest will not be charged on purchases, balance transfers and cash advances if you pay your entire balance by the due date each month. Refer to your account opening disclosure for additional details. You have 15 days after your due date to make your payment before a late fee is applied. Why is my monthly payment not displaying online? Your payment will display in the "payment" field on your balance page once your statement has been generated and your payment calculated. Once your payment has been made, the payment will be removed until your next statement date. You will still be able to make additional payments and transfers using the transfer feature. When will I start to see my FICO Score on my statement? Your FICO Score may take up to two billing cycles to show up on your statement. From then on, you should see it on every statement. For more information, click here. Can I do a cash advance to my checking? Yes, just transfer 'From' your credit card 'To' your desired share in online banking. Can I conduct balance transfers? Yes, to conduct a Balance Transfer you can either select the gear icon next to your Credit Card share in Online Banking, or by visiting your local branch. You can request convenience checks by contacting us at (800) 743-7228, or by visiting your local branch. Can I use my Arrowhead Visa as overdraft protection for my checking? Yes, to set up overdraft protection, use the gear icon next to your checking share. You may also contact us at (800) 743-7228, or visit your local branch during normal business hours. You can contact us at (800) 743-7228, or visit your local branch during normal business hours. For hours and locations, click here. Who can I contact if I have any questions regarding my Arrowhead Visa? Is there anything I should know before traveling with my Arrowhead Visa? Before you travel, contact us at (800) 743-7228 to let us know the dates of your trip. For more information on traveling with your Visa card, click here. *All rates and terms are subject to change without notice. Rates listed are Annual Percentage Rates (APR) and our current lowest rates based on approved credit. Borrower’s actual rate may be different based on terms and conditions, credit history and ability to repay. Some restrictions apply. Loan subject to credit approval. Not all members will qualify. 1APR=Annual Percentage Rate. Best rate is for top tier credit. Subject to approval. Rates may change at any time without notice. APR will vary with the market based on the Prime Index. Rates valid as of . View the Visa Rate Schedule and Agreement and Disclosure. 2 The FICO Score provided to you is the FICO Score 9 based on Experian data, and is the same score that Arrowhead CU uses, along with other information, to manage your account. The credit file used to create your FICO Score is continuously updated, and this FICO Score may not reflect the most current data on your credit file. The FICO Scores and associated educational content is provided solely for your own non-commercial personal educational review, use and benefit. FICO is a registered trademark of Fair Isaac Corporation in the United States and other countries.